Nowadays, the duplex crystal chandelier has become the choice of many people for house decoration, because such chandelier can make the decoration more beautiful and the home warmer. Actually, when choosing this kind of chandelier, it is necessary to pay attention to the brand reputation as well as the tips for selection. Consumers can also pay attention to some brands available on the market. 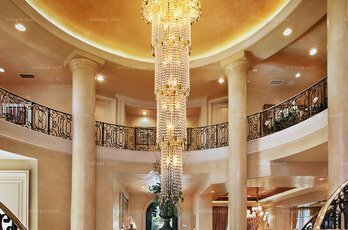 When choosing the duplex crystal chandelier, the height shall be considered first. When hanging it, you need to pay attention to whether the ceiling height is enough. Also, you shall confirm whether the surface of the light needs to be plated or painted, which actually plays a very important role. Particularly, when purchasing the chandelier, the workmanship must be inspected to see whether the surface adhesion and hardware surface are satisfactory or not. Another point worth noting is to inspect whether the hardware fittings of the duplex crystal chandelier are blackening, rusting or paint-shedding on the surface, and whether there is any color difference, deformation or burr. Paying attention to and learning about those problems can also help you better carry out the inspection.